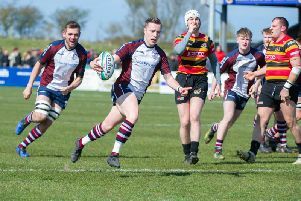 Scarborough weathered a second-half fight-back by Yarbury to pick up their second win of the season. The away side dominated the early stages running in three tries through Jordan Wakeham, Ian Williams and Tom Ratcliffe, but when influential kiwi Isaac Faamau limped off the visitors seemed to lose their way. Yarnbury got on the scoresheet with a long-range penalty and they reduced the arrears even further when Ratcliffe's pass was intercepted and the hosts went over. Just before half-time James Leach went over to make it 22-8 at the break. Yarnbury were out of the blocks quickly in the second half with Scarborough struggling to get any possession. Tom Harrison was sin-binned for a high tackle and was quickly followed by Loni Loni, before Yarnbury finally went over the whitewash with 10 minutes left and a further try followed soon after. It was now a four-point game and Scarborough needed to steady the ship and returning skipper Matty Jones settled the nerves with a try under the posts, which was converted to make it 29-18. Yarnbury would not lay down and responded instantly with a converted try of their own making it 29-25, and there was still time for Ratcliffe to miss a long-range penalty, but the visitors held out for a bonus point win.